Hereford: In the middle of Charlotte’s Snowpocalypse 2011, Angus and I and our significant others ventured out of our homes and into the ice to find ourselves some burgers. 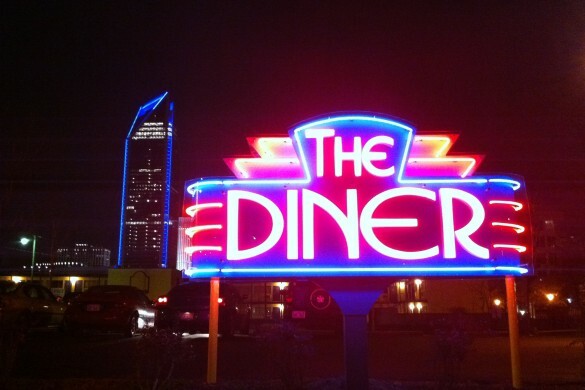 We drove past Bank of America Stadium and back to the west side to The Burger Company. 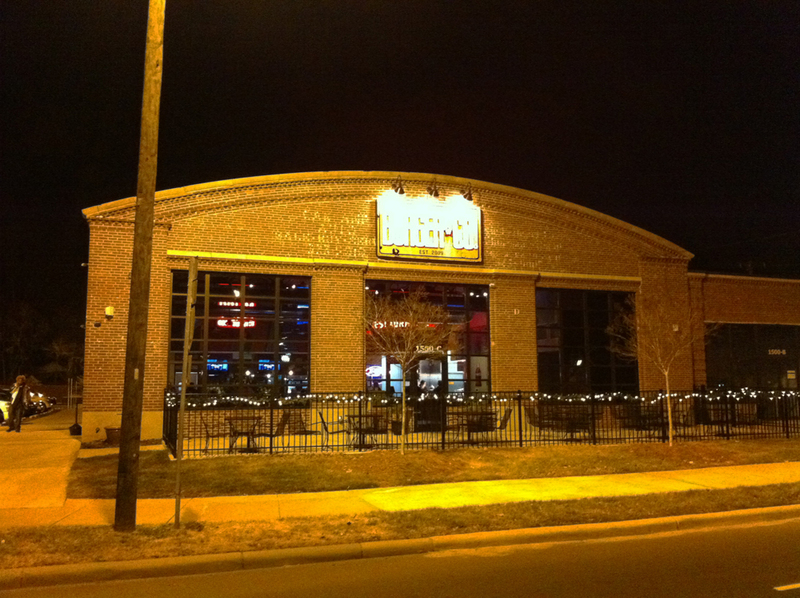 The Burger Company is right across the street—in fact, they are visible from each others’ windows—from the first place we reviewed: Pinky’s . Angus: Well, the first that we reviewed, wrote down, AND published. I like to think that we’ve “reviewed” a lot of places before we started posting them to the internet. 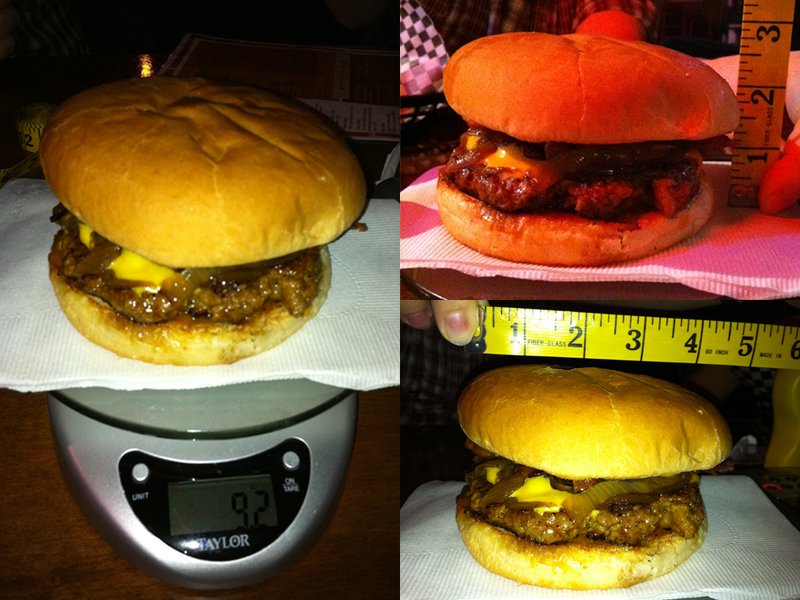 Well, since they are so close to each other, and they’re both hamburger joints, they invite comparison. 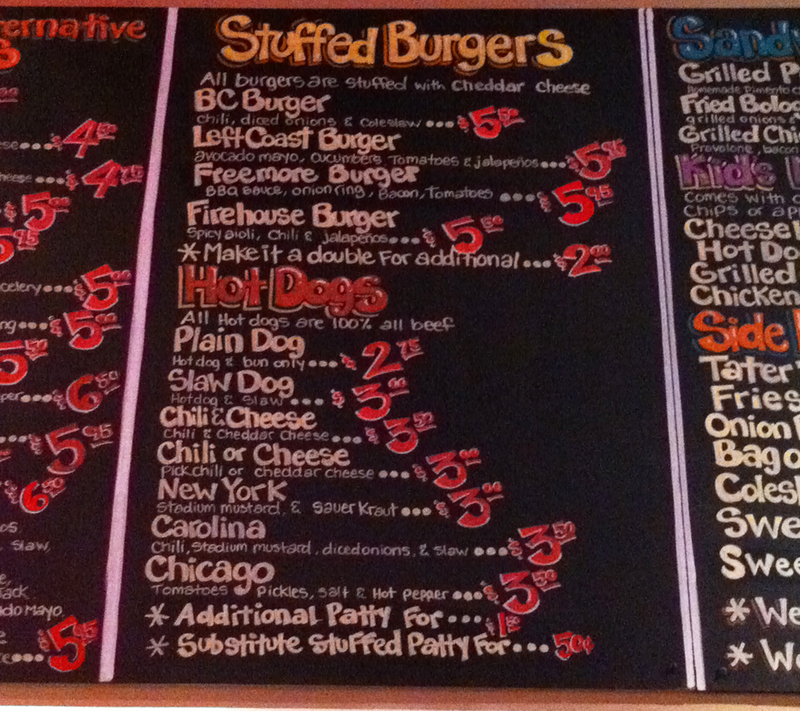 If you’re in that area of the city and you’re jonesin’ for a burger, to which place do you go? That was what we set out to decide. 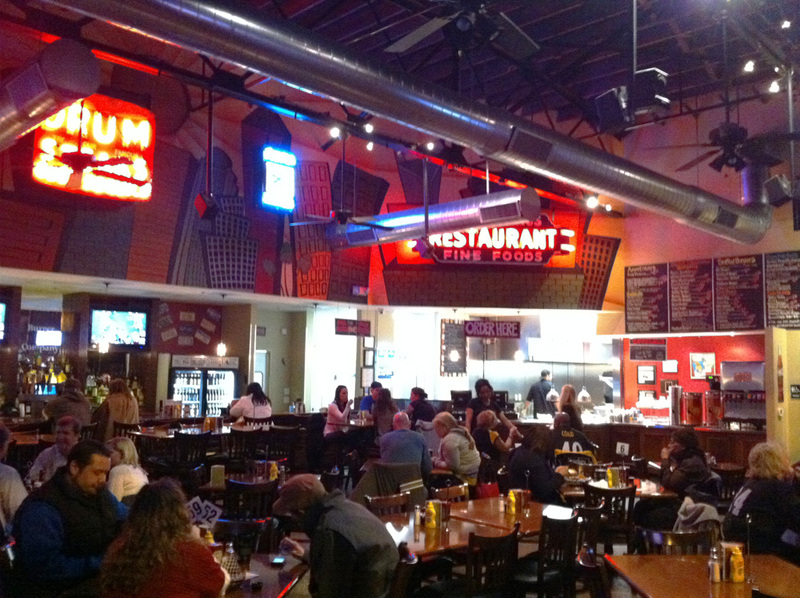 Angus: When you walk into the Burger Company you find yourself in one room that looks vaguely industrial. They have high ceilings, exposed duct work, and the building looks repurposed, but they don’t really use that as a theme for the restaurant. The high ceilings make the place look bigger than it is. 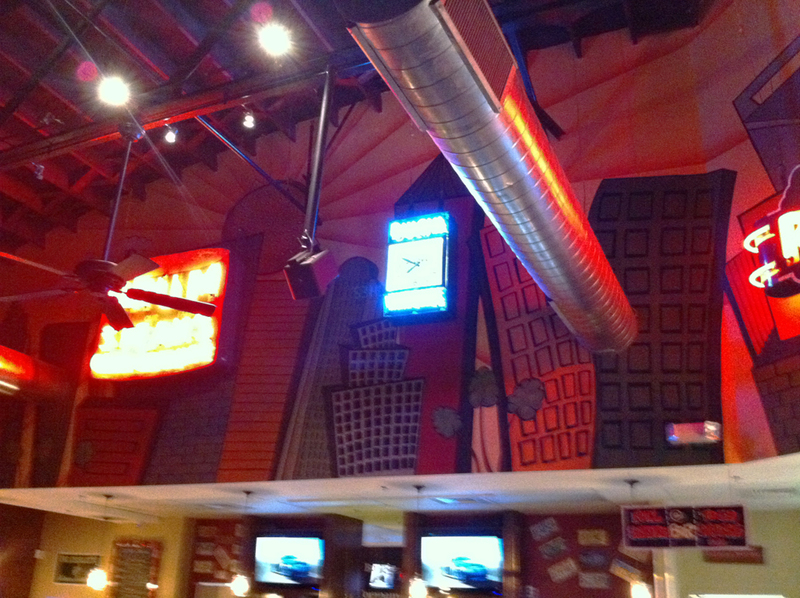 Also because of the high ceilings, they have a lot of wall space over the bar. They used that as an opportunity to have a nice, cartoony mural of the skyline of Charlotte. We thought it was pretty cool, and we liked the fact that it included the Duke Energy Center. And that the sun was a hamburger. Hereford: They also have some cool old signs up. 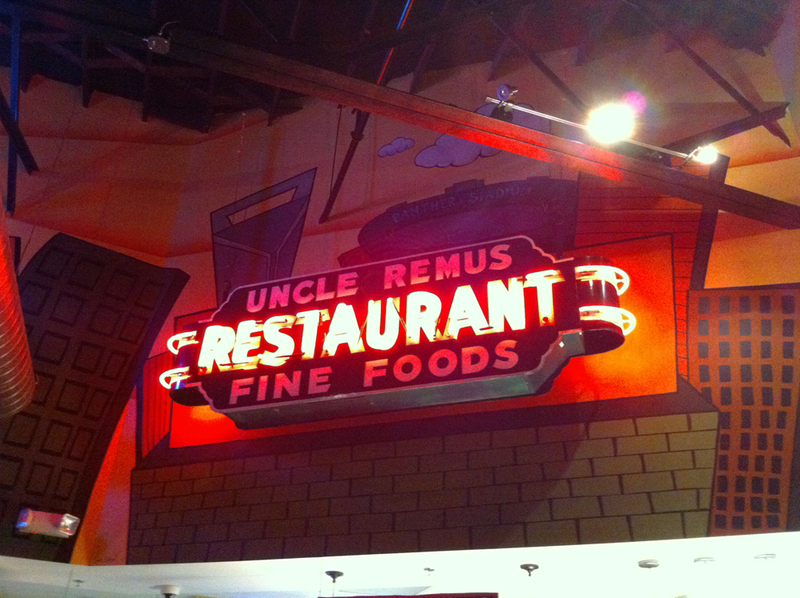 They have a nice classic sign for “Uncle Remus Restaurant & Fine Foods.”Not being a Charlotte native, it made me wonder if it is from the city or not. 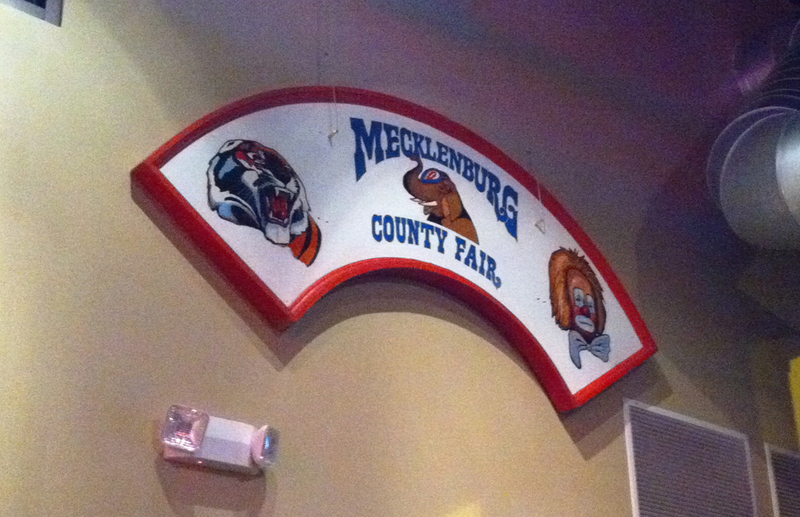 They also have a sign for the “Mecklenburg County Fairgrounds,” and I’m not sure if it is actually from there or not. My initial thought was that it was not, but now I’m thinking that maybe it was—I can’t think of any good reason for someone to counterfeit it. 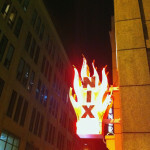 Angus: We liked those signs, but there was one that I thought was strange—the Bulova Watch neon sign. I have nothing against the sign itself (heck I got a Bulova watch on my nightstand right now) but it obscured the mural and otherwise just seemed random. Maybe there’s a reason it’s there—I just don’t know what it is. Otherwise, they had very typical bar decorations. They had several TVs on sports channels, and they had the requisite Golden Tee machine. They had license plates on the wall too. I’m fairly convinced that people put only those up when they can’t think of anything else to do. 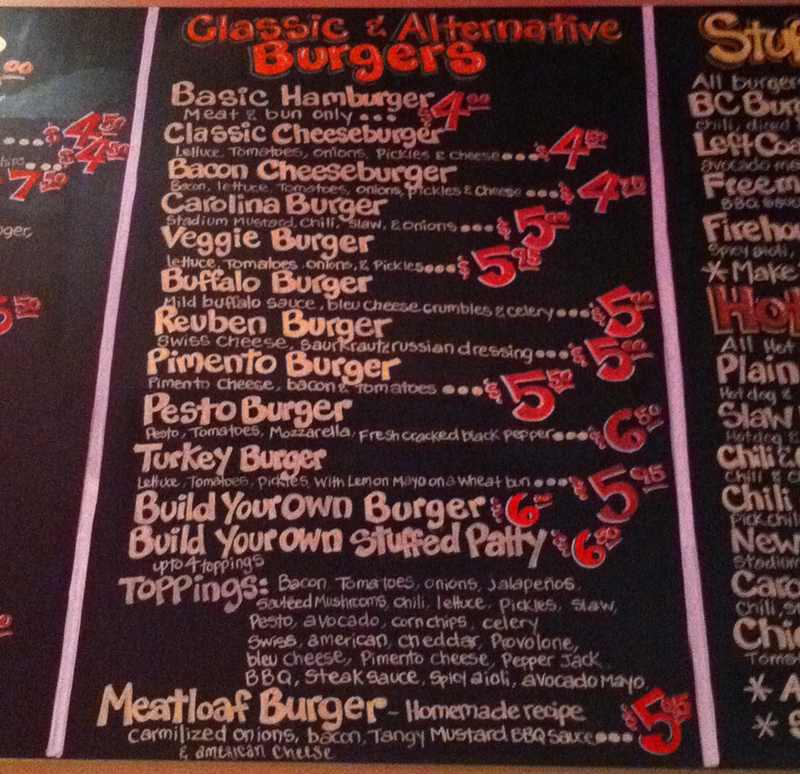 They have a large chalkboard menu above the ordering counter, which I always think is cool. But, the writing and everything on it seemed a little too perfect. I doubted if it was created with real chalk. I really wanted to walk up there with a wet rag and wipe off a little bit to see. I figured they would frown upon that, though. Too bad. Hereford: They also had a sign advertising a 29¢ hamburger for lunch. It’s the type of sign that is made as a cheap nostalgic decoration, but I wondered after seeing it there if you would have a legal case if you demanded a hamburger for that price and they didn’t accommodate you. It certainly doesn’t say anywhere on it that they don’t mean it or that it’s a joke—maybe some forceful and possibly litigious person could get a cheap meal out of it. Angus: We were there for dinner, so we didn’t think we could try that. Unfortunately. Hereford: You seat yourself at the Burger Company, and when you do someone who works there drops by a menu. I wouldn’t exactly call that person your server, though, because they don’t take your order. 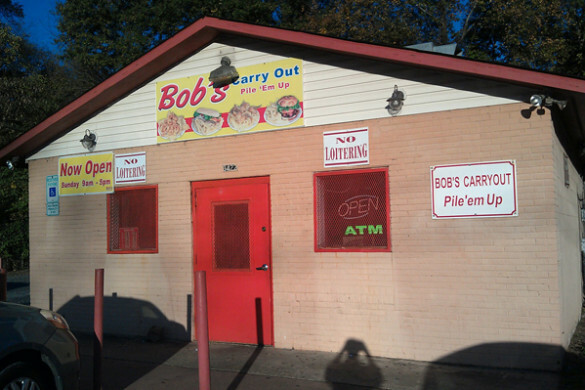 They walk by and greet you and let you know to walk up front to place your order. I thought it was a strange process for the type of restaurant I saw the Burger Company as. Based on the décor, and the lighting (I think you can assume a lot about a restaurant based on its lighting) I wouldn’t think of the Burger Company as an old style lunch counter, but that’s what their service system is. You have to walk up to the counter to order. 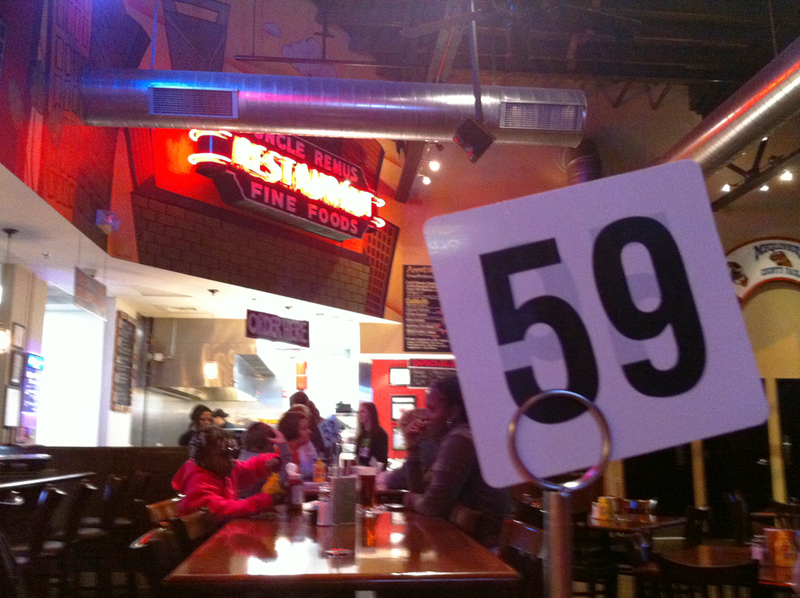 They give you a number, and they bring your food out to you. I have no problem with that system when it seems appropriate , but I thought it didn’t match the type of restaurant that the Burger Company was—or at least my own concept of what it was. Angus: And I was annoyed when I went up to order and the lady ahead of me didn’t bother to decide what she wanted until after she got there, then she took her time making conversation as she decided. That’s fine if a waitress is taking your order, but not if there are other people in line behind you. And then there’s the question of the tip. At the Burger Company you tip before you even get your meal, which I certainly have reservations about. Your tip cannot reflect, good or bad, the type of dining experience you had. And, the tip is shared, which I never like. I like to reward the person who gives me good service when it applies. 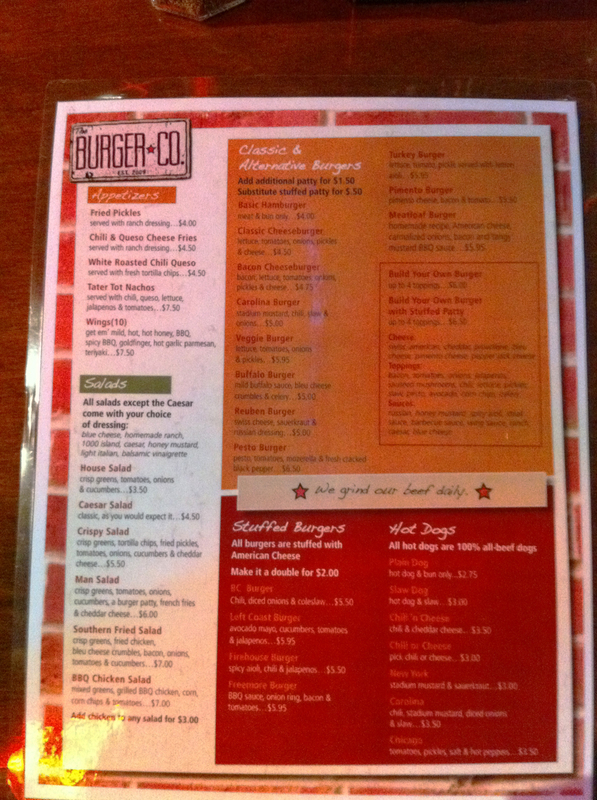 Hereford: When we sat and one of the workers came by our table and told us of how everything worked there at the Burger Company, and I asked her what was the best specialty burger served there. (I wouldn’t want to be one of those people I just griped about). Homemade recipe, American cheese, carmelized onions, bacon and tangy BBQ sauce. I found this intriguing—none of the other burgers claimed to have a “homemade recipe,” and I wasn’t sure exactly what that would mean, although I assumed the meat would be somehow prepared differently. I thought that maybe, like a lot of meatloaf recipes, that some type of tomato sauce might be cooked into the meat, which seemed like it could be interesting. I was excited about what it might be like. Angus: And I decided to make my own burger. The Burger Company has a lot of really good options for making your own burger, including the possibility of getting a stuffed burger. Stuffed burgers come with cheese packed into the middle of the patty, giving you some extra cheesy goodness. So I got one of those. On top I got a slice of pepper jack, lettuce, and Russian sauce. Hereford: We each ordered an Old Mecklenburg up at the counter, and they came out pretty quickly. What really impressed us, though, was that it came out in an Old Mecklenburg glass. Angus: I always like when places do that—match their pint glasses to the brewery. The Burger Company has a pretty decent beer selection, but not much on draft. (Old Mecklenburg is one of those that is on their draft list). Hereford: A small bonus and a cool thing about the Burger Company is that if you order a normal priced soft drink, you get a decently nice plastic cup that you can take home with you. I like that you get a small souvenir for that cheap. Angus: Only ten minutes after placing our order, our food came out. That’s pretty quick. *The cost of neither burger includes the cost of sides. Fries cost an additional $1.50. Angus: As you can see from the photo, my burger came loaded with cheese. In fact, when I took my first bite, it was like a grenade of cheese exploded in my mouth. That’s not a bad thing. If you want cheese, they have a great way to accommodate you at the Burger Company. The bacon was way to crispy but there was a lot of it so it is hard to complain. I just feel that you can enjoy the taste of it more when it is more on the floppier side. 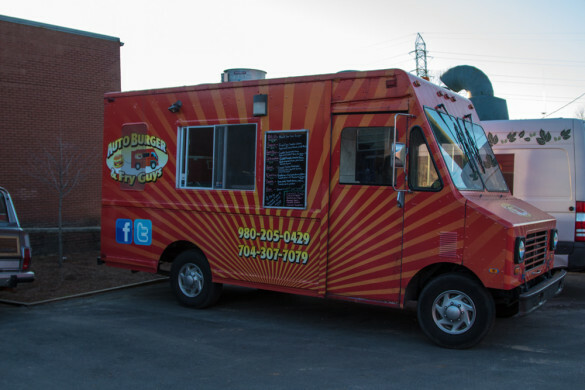 Now this is a first for The Charlotte Burger Blog where a burger does not have shredded lettuce, or the big “garnish” lettuce, or even iceburg lettuce. Instead my burger came with what it looked and tasted like a garden salad lettuce. By this I mean it had all types of lettuce and I think I even spied a few cuts of carrot in there. This is pretty odd and it feels like they just opened a bag of lettuce from the grocery store and dumped it on my burger. Now overall my burger was quite tasty but there was nothing special about it except for the stuffed patty with chessy goodness. Hereford: So, I wouldn’t say that my burger was bad, but it was a disappointment. That was largely because it did not, at all, taste like meatloaf. I don’t know what the “homemade recipe” alludes to on the menu, but I was clueless to what it was or how it affected the taste when I ate it. Maybe it had some different spices in it or something, but I thought the meat tasted normal. I think, though, the only difference I could see between my Meatloaf burger and a normal bacon cheeseburger was the mustard BBQ sauce. So, while I didn’t think that it came out as advertised, it didn’t start off as bad. I initially thought it was quite good. I liked the onions, the cheese, and the bacon—it all tasted good. The mustard BBQ sauce was different from you would normally find on a burger, but it was also tangy and good. But it wasn’t very thick and before I finished it had, along with the grease from the burger, immersed itself in the bun. To finish eating the burger, I had to reverse it. The bottom bun had become completely insubstantial and I had to flip it vertically, using the top bun to stabilize the remaining portion of what I was eating. I have to give a burger some demerits when that becomes necessary. And, at that point the grease had overloaded the rest of the burger. The tastiness of the burger, thus, faded kind of quickly as I ate it. Angus: We had three different sides at the tables. We ordered fried pickles, which have become ubiquitous at burger places in Charlotte. We had fries, which were pretty good. They were a medium thickness fry—between shoe string and steak fry—and were decently average. We also had some sweet potato tots, which is pretty unique and pretty good. Hereford: So, in the end, do you go to the Burger Company or Pinky’s if you’re in Westside and need a burger? 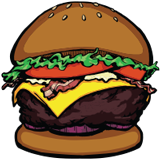 Well, the Burger Company has a larger menu of specialty burgers, and if you find one there that you love you’ll probably want to keep going back to get it. But, otherwise, we feel you’ll probably like Pinky’s more. 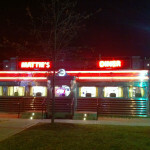 It’s more distinctive, has a better atmosphere, and they have pretty good burgers. Hereford: Unless you’re one of those Golden Tee guys, in which case it’s no choice at all. 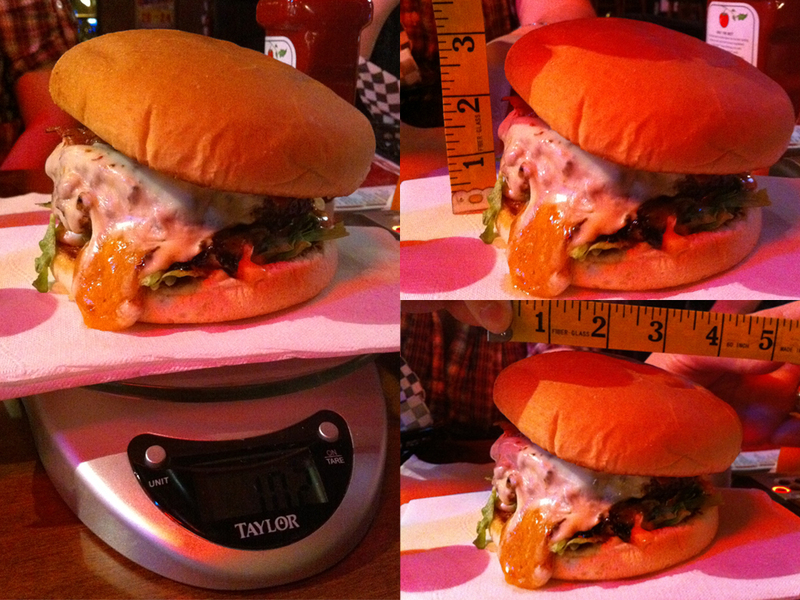 Food: 3.5— Although Hereford’s burger was too greasy, the food is definitely above average. They also have a lot of selection and a lot of original recipes, which is great. However, we hope that the ones we didn’t try are more special than the Meatloaf Burger was. Service: 3—We’re not trying to say anything bad about the people who were working there on the night we came in to review the Burger Company. They were all polite, friendly, and the food came out quickly and everything. But we simply dislike the style of ordering there, so we knocked it a couple of points. Theme: 1— We don’t think the Burger Company really has an identifiable theme. In fact, they don’t really have a lot of unique personality at all. Atmosphere: 3.5— Despite the fact that they don’t have unique personality, it’s not a bad place to hang out. They have a lot of TVs up, so it feels kind of like a sports bar. We just don’t know if it’s the type of place that you would want to spend all night at. Beer Selection: 3.5— We really liked their beer selection. The only thing really keeping their rating from being higher is the fact that they don’t have more draft options.